April 16, 2012 - Monday Morning!! Hey everyone!!! How was your weekend????? Did you have a great one?? Did you do fun things?? Did you miss me??? I must admit... it was a bit strange to get up early in the morning and not post! However, it was great to get some computer work done and then I got to read the BLOGS I love to read each day...hahahahahaha!!! I wonder how many of them there are ?? A zillion I'm sure... wow... I can remember just about 12 years ago hearing people tell me I needed to get the store on a web site. I had no clue what they were talking about. Look how fast things have changed in just the past 10 years. Unbelievable isn't it? 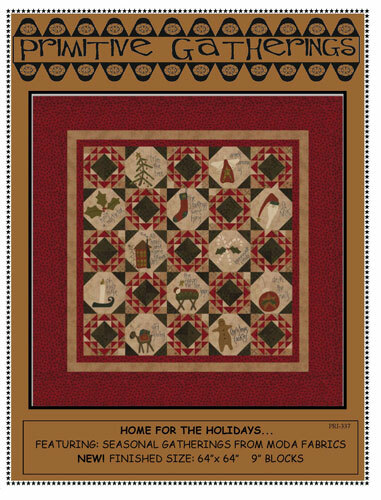 The quilt is called "Home For The Holidays" and it's just down - right - adorable!! The little applique blocks have wool and stitching on them! Is this NOT adorable!!! I'm just waiting on the fabric to arrive so I can get started! Lisa is such a great designer... love her to death! 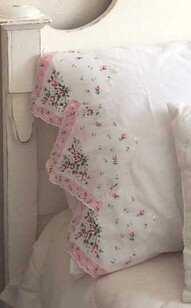 I'm pretty sure Karen will be kitting these sweet quilts so keep an eye out with her newsletter and watch her website. It will take awhile to get the sample finished...so be patient!! I couldn't remember if I mentioned this trick before... so if I did... sorry. I just think this is so cute! They've taken hankies and attached them to the end of a pillow case. Isn't this sweet? Wouldn't it be wonderful to use hankies that may have been your mother's or grandmother's and re-purpose them into something you can use? How sweet to know that you are sleeping with them at night!! VERY pretty in a little girl's room too!! 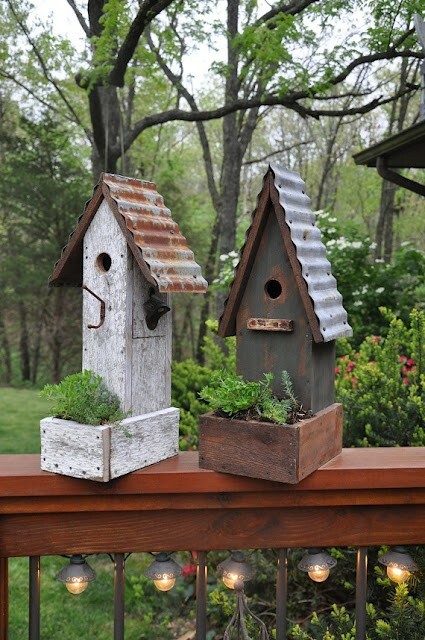 I don't know what it is about birdhouses... but I simply love them! The older and rustic they are the better. When I saw these... I just had to share them. Are they adorable as little planters with your herbs??? I wonder if the birds would eat the herbs? Oh well... one way to find out is to plant some. I especially love it when they take the old tin and add it to the roofs...and look at the old hardware for the perch. It looks like an OLD bottle opener on the side. Adorable... LOVE THEM! I found some more "down memory lane" photos I wanted to share with you!! 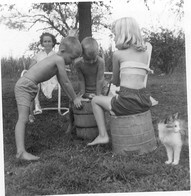 Remember making home made ice cream when you were a kid? You know... the kind we had to crank? I loved doing that in the summer. Daddy had the best recipe for vanilla - YUM. It would be ssssssssooooooooooo cold we would get "freezer headaches" !! I remember we had to put it in the yard... out by the end of the sidewalk so the water drippings (that had salt in it) would run down the driveway and not into the grass (the salt would kill the grass). Wonderful memories!! LOOK!!! 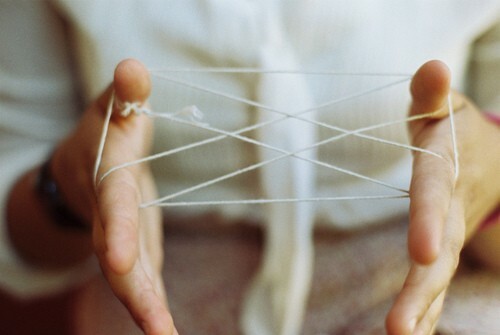 Remember playing hours and hours on end with the string? Remember the Cat's Cradle... and I could make a tea cup. Then there was the one where it took two people... can't remember what we were making though. Gosh.. I loved doing this.!! Here's my all time favorite doll... Betsy McCall. I KNOW I've mentioned this before... I NEVER GOT ONE of these! 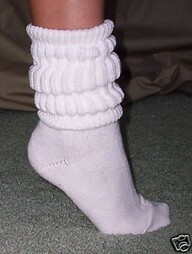 Maybe I'll have to find an antique one and give it to Eden or Lexie so I get this out of my system!!!! hahahahahaha!! It's scarred me for life...can you tell? 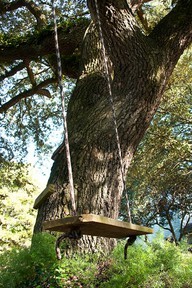 Then...there was our tree swing... hours and hours of swinging. Daddy put it in a HUGE maple tree! There is just something about the sound of the rope creaking that is wonderful. Pumping your feet and legs as hard as you could...to get as high as you could go!! LOVED IT!!! I burst out laughing when I saw this! Now... my friends... this piece of furniture (not quite like this one) is the first piece of furniture Jack and I bought together after we were married. That was the last stereo we owned! Isn't that silly... we've never been big listeners of music... we love it... just wasn't something we spent money on. Today I'm working on my TO DO list and crossing things off. Isn't that a wonderful feeling? See you tomorrow... HAVE SOME FUN TODAY! !